THE JEWS OF LITHUANIA serves well as a general introduction to one of the most diverse, vibrant Jewish communities to have flourished anywhere at any time. 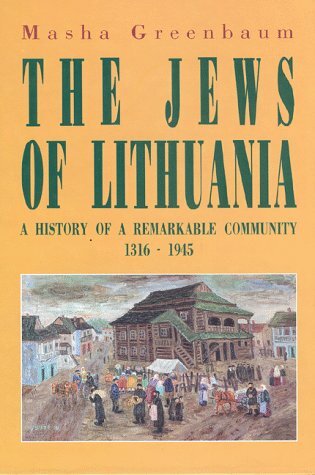 Unfortunately, the book is superficial, giving only a summary view of the 700 year history of Lithuanian Jewry. It fails to provide much in the way of depth or "color" in regard to the Jews who were such a vital part of Lithuanian history from it's beginnings. Of particular note are the facts that Lithuanian Jewry had its roots in the slow dispersion of the Sephardim during the Reconquista of Iberia. It is instructive that in only two countries---Spain and Lithuania---were Jews permitted to be titled landholders. 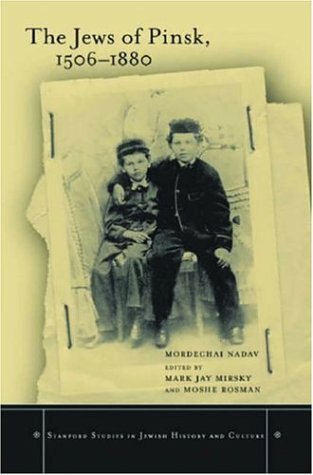 The author, Masha Greenbaum, fails to analyze these fascinating facts, or draw historical conclusions, of these, and many other elements, (though they are reported in passing), and thus fails to make an account of the earliest underpinnings of the community, or speak on its shared values as they developed. There are better books on Lithuanian Jewish history, though this one is generally available, and is certainly readable. There are some historical errors which detract from the book's value as source material, but as a "starting point" for the investigation of Lithuanian Jewry, the book most definitely suffices. For Jews tracing their families in Lithuania, the large number of localities named will be helpful, as will the discussion of the liquidation of those communities. Given the vast scope of the subject, it is to be hoped that a better, more in-depth, and sensitive and sympathetic volume is in preparation somewhere. This is a general History with a lot of errors. This is a poorly written general History.The title of the book is misleading.The book concentrates on the modern era.There is alot of imformation on the old Kehilla era of Jewish History.This is a periodfrom 1400 - 1700 at least.This book gives only the minimal description ofthis era.The authors idea of Jewish History in that pre-modern era, whichin Lithuania extended until the mid 1800's was to tell about therelationship that the ruler of that area had with the Jews.The reasonthat I gave this book such a low rating is that it is full of Historicalerrors.For example she writes that the Decembrist revolution happened in1827, it really happened in 1825.While many of her Historical errors areminor, like saying that the infamous, 'Protocols of the Elders of Zion',was written in 1928.When it comes to the History of the Orthodox and theYeshivot, the book is full of gross errors and misunderstandings. As anexampe, her attempts to explain the reason why there was a rebellion inSlobodka against the 'Alter' and his form of Mussar is so wrong that it iscomical.The 'Alter' had no official position in his own Yeshiva.A partof his form of Musar was allowing each student to develop on his own. Tight control was not part of this system.Saul Liberman, who later becamethe head of JTS - the Conservitive Seminary in the USA, learnt in Slobodka. Even though it was already known at that time that he had some liberalideas.One of the Alter's most promenant students, R. Avrohom Elya Kaplen,later became head of the Rabbinical School in Berlin and was one theRabbinical leaders of the Mizrachi movement.Another one of the Alter'sstudents was R. Aharon Kotler who founded the most promenant 'Torah' onlyYeshiva in the USA in Lakewood NJ. This is not the only gross error in thebook.Another example is that she only gives the last un-official chiefRabbi of Vilna, Rabbi Chaim Ozer Grodzinsky only one comment, and it isn'ta positive one.R. Chiam Ozer was once offered the official title, butturned it down.He was one of the leaders of Lithuanian Jewry for over 40years, and a fascinating and brilliant man.You would think that hedeserves more than one negitive comment. I found this book to be a very good introduction into the history of the Jews in Lithuania.I would recommend it to anybody who is interested in the subject. In addition to that this book represents a good example ofthe History of Lithuania through the Jewish eyes.I believe that the Jewshave the same rights on Germany, Poland, Lithuania, Russia and some othercountries to name a few, as the non-Jews do.Therefore, the books likethis one have to be written about each and every country where the Jewsused to live for any extended period of time, regardless of the fact ifthey are still living there today.That would allow the next generationsof the Jews to clearly see that some of the local `heroes', whose staturesare still standing tall in the main squares of some of the European citiesand who themselves are considered to be the liberators of the localpeoples, were in fact thugs and anti-Semitic pigs who slaughtered thousandsof Jews during their reins in power (Bogdan Hmelnitskij -- the hero of theUkrainian people whose name was mentioned by Masha Greenbaum in her bookwas one of them).That would clearly show to the Jews that some of theevents in local history of those countries, that are considered to be goodand progressive for the countries and the people that they affected, infact adversely affected the Jewish population of those countries.The mostrecent example of them all would be "The Perestroika" and thedissolution of the Soviet Union.Although considered to be a very positivedevelopment by a lot of people, both Jews and non-Jews alike, it brought tothe surface a rapid activation of the anti-Semitism all over the formerSoviet Union that made the lives of the hundreds of thousands of the Jewsthere completely unbearable. The conventionally written (mostly by thenon-Jews) history books at best either do not usually pay much attention tothe lives of the Jews in those countries, or at worst they paint the Jewsof those countries in an untruthful and negative way.From my point ofview, that not only represents an incorrect and incomplete approach tohistory, but also denies the Jews of a big part of their cultural andhistorical heritage.The books like The Jews of Lithuania: a history of aremarkable community, 1316-1945, if written about other countries, wouldhighlight the truth about the Jews and their contribution to the countriesthey were living in. This book is an amazing resource for anyone wanting to learn about the history of Lithuanian Jewry. It was fascinating reading, although not light reading. Greenbaum covers the rise of the various political, religous andzionist movements within the Jewish community, and most importantly, putsthem within their historical context. The depth of her research isoutstanding. I strongly recommend this book. I'm preparing about this region..
Good detail for a short book. Book covers a wide time span with just the right amount of detail. Doesn't read like a textbook. Excellent book. I learned a lot about Polish history. I found it very interesting and easy to read. I highly recomend this to others. I bought the book thinking it dealt with warfare in the XVII century but it is not. The main topic is how The Polish-Lithuanian Commonwealth tried to survive by looking for the right alliance with others powers. These outer diplomatic strategies were obstaculized by the inner political problems. 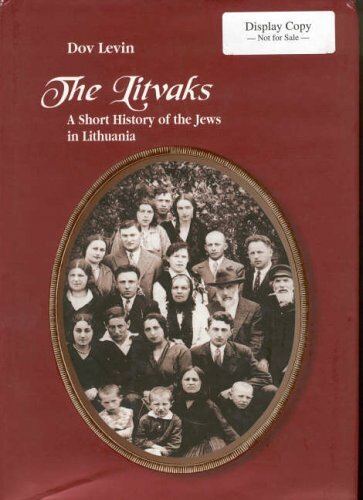 The Litvaks, A Short History of the Jews in Lithuania, is a book, of not only history, but one of insight into the vibrancy and the demise of the Jews and of their geographics and culture, religion and fight for survival, within the ever-changing demographics of the country. This is a poignant book, detailing the history of Lithuanian Jews, from the 1300s through the present, detailing the end of WWII, including the Holocaust, through the present, through survivor histories. The author manages to detail lifestyles, from banking to education, and cultural practices, and how they apply to the governmental discrimination and restrictions imposed upon the Lithuanian Jews (and, Jews in general). 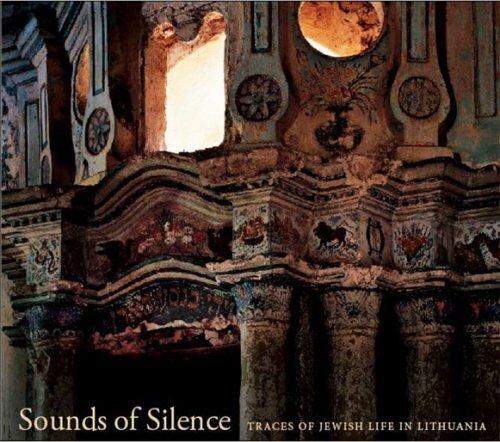 I am grateful that Dov Levin undertook the research, and the writing of this insightful and informative book.I found a lot of my own familial ties inside the pages, not only the cities, and Shtetls, but the emotional and traditional ties that bind me to the past, and in particular, bind me to Lithuania. The Jews and their will to survive, their will to keep the past within the context of the present, their strength to overcome the adversity, yet keep the devastation of the past, in the forefront, is part of my ancestral history, an innate part of me that felt, strongly, every word on every page of this excellent book, by Levin, and I have taken the knowledge garnered and applied it to my own familial roots.I will continue to strive to keep Levin's tribute of the Litvaks a part of ancestral documentation, from mother to daughter, to son, and down through the generations. Battle in the Baltics 1944 - 1945 is an exclusive insight into the last frantic months of the Wehrmacht and Waffen-SS on the Eastern Front 1944 - 1945. From mid-August 1944 there was nothing but a drum-beat of defeats for the German Army as it fought to the grim death to try and hold back the overwhelming might of the Russians from reaching the borders of the Reich.It was in the Baltic`s where Army Group North played a decisive role in trying to stem the rout and preventing the fragile lines from finally being smashed to pieces. Drawing on a host of rare and unpublished photographs accompanied by in-depth captions, the book provides a revealing insight into the last desperate months of the war. It reveals in detail how the remnants of Army Group North were driven back across a scarred and devastated wasteland to the borders of Estonia, Latvia, Lithuania, East Prussia and Pomerania. What followed was the Battle of the Baltic`s where exhausted and undermanned German forces fought to almost near extinction against the constant hammer blows of Soviet ground and aerial bombardments. The book's a sham and shamelessly uses photos taken prior to 1944, thus before the campaign supposed to be the object of the book. The so-called author going as far as picking ones that originate from the western front. What's more, many are blurred or without any interest whatsoever, repeat without any interest. I mean blurred for most because the quality of reproduction has been bungled together with the quality of the paper which stinks on top of that. To be thrown into one of Goebbel's bonfires without hesitation. This book is exactly what the subtitle says it is, a photographic history of Army Group North from the defense of Narva til the bitter end, although it does include some photos from Barbarossa. It is packed with a lot of interesting and rare photos of this often overlooked part of the Eastern Front, mostly from Bulgarian archives. Accompanying the photos are brief summaries of the different stages of the army group's retreat, along with orders of battle. Although a serious student or aficianado of the Eastern Front might find this volume lacking in textual content ,it does give an excellent historical and photographical overview of the latter stages of the war. It is perfect for a newbie that is just getting started, and also nice for the more well read students of the Eastern Front just for the pictures alone. All in all, it is a nice addition to anyone's Eastern Front collection! This book has numerous errors in the text, something which is unforgivable in a book of this type.The pictures are redundant and boring.For those who know nothing about the topic this may be of passing interest, but for all others it is a waste.Definately NOT worth the price. 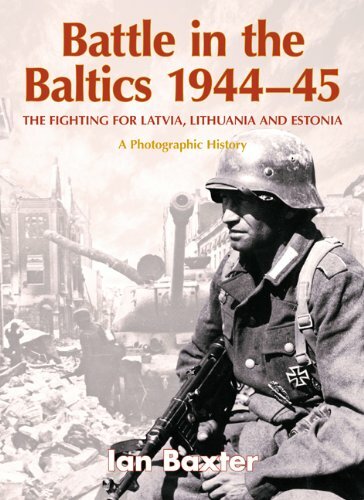 "Battle in the Baltics" purports to be a photographic history of fighting for Latvia, Lithuanian and Estonia. It is nothing of the sort. Working off what appears to be a trove of Bulgarian-held German-soldier snapshots of fellow soldiers, there are endless closeups of Germans in foxholes, Germans next to a cannon, Germans looking this way and that. The rare long view of an unrecognizable village, usually an Estonian one, is a relief, but there's no history or geography to speak of here, only the feeling, once you're done paging through this disappointing throw-away, that you've been had. A rare subject...and in English, too! As a Lithuanian-American, it's wonderful to finally find an account of my national history that is written in English.This is an academic book, so I find it easier to dip into it rather than read it from cover to cover, but the writing is generally clear and straightforward.For any first-generation Lithuanian-American who wants to remember what they learned long ago during Lithuanian Saturday school, this book is well worth the price. 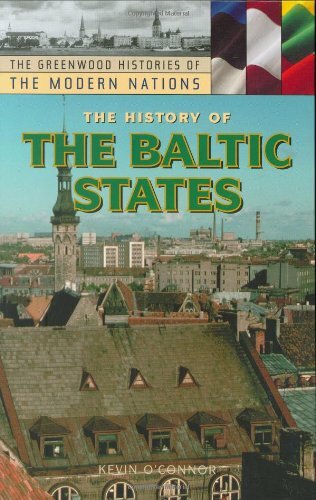 I heard people praise S. C. Rowell for this book, but spending $100 on a book that dealt only with 50 years of Lithuanian history seemed way too much. However, eventually I bought it -- and that's the best history book I have ever read. Most histories are just chronological narrative of wars, battles, and other events. 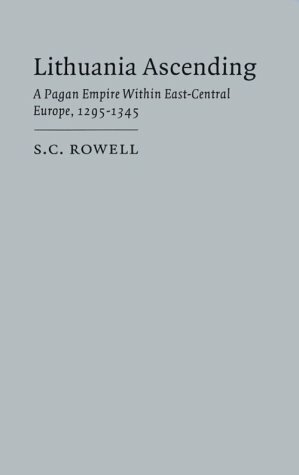 What Rowell did was taking extremely scanty historical sources and piecing together a full view of history: wars, diplomacy, succession disputes, religion (paganism vs Catholicism vs Eastern Orthodoxy), culture, etc. and how everything inter-relates. His scholarship is rock-solid and you just pray for a sequel. It is very different from usual over-generalized histories that are available. This one takes down to the very core of such claims as "Gediminas arranged shrewd marriages for his children." While you can easily find a list of these marriages elsewhere, the real appreciation comes only after reading Rowell's analysis. You can actually start understand what it was like to be sent over to an enemy's son to establish Lithuanian interest in some far-away region. Amazingly, it is done using not empty rhetoric but historical facts and documents. So go ahead any buy this book. Hopefully, you will also learn how to write histories and conduct academic research. This is an extraordinary scholarly work. 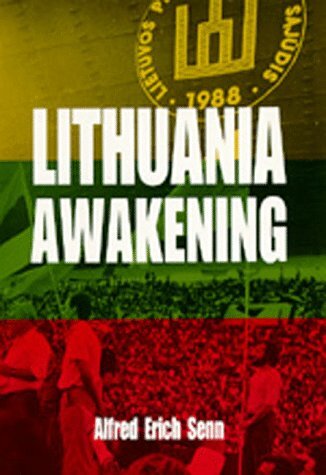 It clarifies the obscurities and subtleties of the Lithuanian situation in the last decades of official paganism when the Lithuanian state rivaled in geographic extent and ethnicdiversity the greatest European nations ever known. 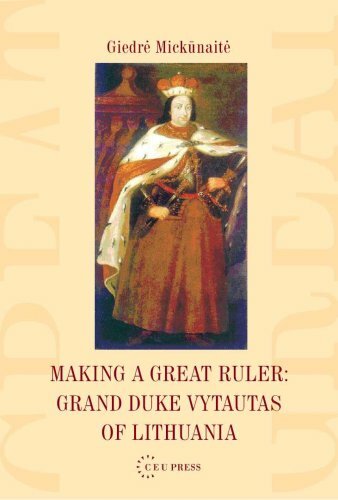 The book primarilycovers the rise and reign of Gediminas, the grand duke who was mostresponsible for Lithuania's astonishing growth in the fourteenth century.The subject in English has been covered only in popular and inaccurategeneral histories by Lithuanians influenced by the politics andmythologizing of the nation's first independence period. 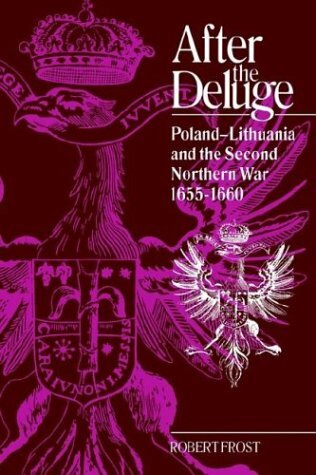 The author wrotethe book while serving as Professor at the Centre for West Lithuanian andPrussian History at the University of Klaipeda, and it represents the firstfruit of Lithuania's second independence in this century. The chaptersinclude information on the importance of the region's peculiar landscape,the economic situation, pagan beliefs and their diplomatic usefulness, therole of Lithuanian princesses in forming marital alliances with Rus'ian andPolish principalities, the exploits of Lithuanian arms in expanding therealm, Gediminas's brilliant campaign in conquering Western Ukraine, itsRus'ian allies against the growing threat of Muscowy, and the attempt todevelope a Lithuanian Orthodox Church in Vilnius are fascinating. One canonly hope that S. C. Rowell will publish a sequel on the next sixty yearsof Lithuanian history to include the rise of Gediminas's grandson, thecontroversial Jogaila Gediminaitis, who became King of Poland-Lithuania,the first federated state in Europe and the largest in its history,Christianized his pagan people, despite their notorious (and admirable)cultural conservatism, and managed, with the help of carefully nurturedalliances first developed by Gediminas, to defeat the Teutonic Order, themilitary superpower of the day, using a NATO style army, Oriental strategyand technology, and Lithuanian ambush tactics. 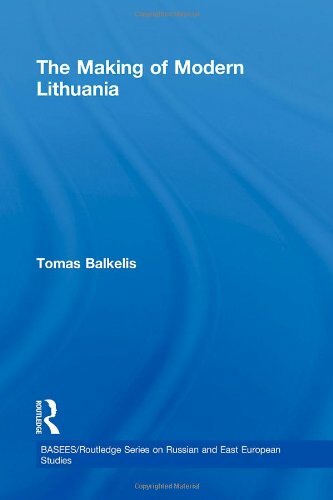 This book lays thegroundwork for understanding the roots of the Jagiellonian dynasty ofPoland-Lithuania and its political and philosophical accomplishments,fondly referred to by the present Pope John-Paul in the text of his speechto the UN a few years ago. The book's extensive footnotes, maps,geneological charts, and huge bibliography, to say nothing of the denselyinformative text, make the book worthwhile to anyone seriously interestedin East European history. S. C. Rowell has written an excellent account of the rise of the Grand Duchy of Lithuania, a pagan empire within Europe that embraced such supposedly "modern" virtues as religious and ethnic tolerance, multiculturalism and multiconfessionalism, although Lithuania's leaders were all pagans who practiced something closer to Hinduism than Christianity, and this at a time when the rest of Europe was winding down from a series of failed cruscades in the Levant and winding up for the domestic cruscades and the Inquisition. What Rowell fails to touch on is how the Lithuanians managed to defeat the Mongols, who ravaged almost everyone else who stood in their path. In doing so Lithuania gained an empire that stretched from Bessarabia and Bukovina in the south to Estonia and east to the suburbs of modern Moscow. Rowell claims the Lithuanian leadership played a careful and calculated, perhaps cynical game of diplomacy with her rivals in the east and west, Russia and Germany respectively. One wonders if the bane of independent small states and nations in this part of the world, "Spheres of Influence," wasn't started by the Lithuanians themselves in interaction with the Mongols. The other thing that left me unsatisfied was the lack of clear reasons for the decline of the Lithuanian empire. Traditionally Lithuanians blame Jogaila, or Jagiello as he was known in Krakow, for selling out Lithuanian territorial gains to the Polish after he married their child queen Jadvyga. The truth may also point closer to home than is comfortable for most Lithuanians: perhaps Lithuanians simply learned early what the British and Russians learned much later (and the Americans have yet to really learn): empire costs its masters much more than it does its conquered (i.e. as in the Red Hot Chili Peppers' song, they gave it away then). The Jews of Pinsk, 1506-1880 is the first part of a major scholarly project about a small city in Eastern Europe where Jews were a majority of the population from the end of the eighteenth century.Pinsk boasted both traditional rabbinic scholars and famous Hasidic figures, and over time became an international trade emporium, a center of the Jewish Enlightenment, a cradle of Zionism and the Jewish Labor movement, and a place where Orthodoxy struggled vigorously with modernity.